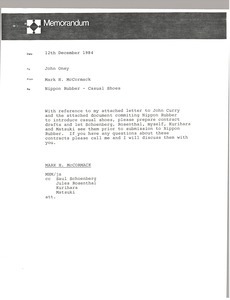 McCormack writes John Oney regarding Wimbledon Shoes. 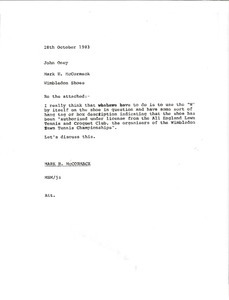 With reference to the attached, he explains what he thinks they have to do in terms of using the Wimbledon logo and indicating that the shoe has been authorized by the All England Lawn Tennis and Croquet Club. Concerning the attached, regarding Nippon Rubber and casual shoes, McCormack asks that contract drafts be prepared. 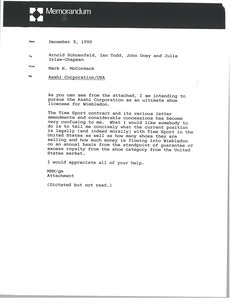 Concerning the attached, McCormack writes that he is intending to pursue the Asahi Corporation as a shoe license for Wimbledon. 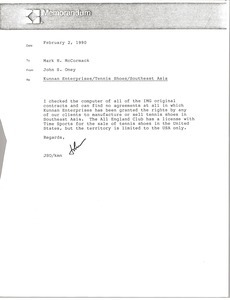 Attached physical fax is very faded.